Throughout history, the road between the east and west has gone through Sorvali. The road went via Saunalahti and not until in 1868 a bridge was built to Neitsytniemi. The earliest map-based data on inhabitation dates back to 1788 with a couple of buildings in the vicinity of Kivisalmi bridge. Actual inhabitation spread to Sorvali at the end of the 18th century when Baron Nicolay had personally parcelled out Sorvali island for inhabitation. A Russian cemetery was founded there in 1799 and at the beginning of the 19th century other religions also had their own cemeteries. The lands belonged to Monrepos mansion. 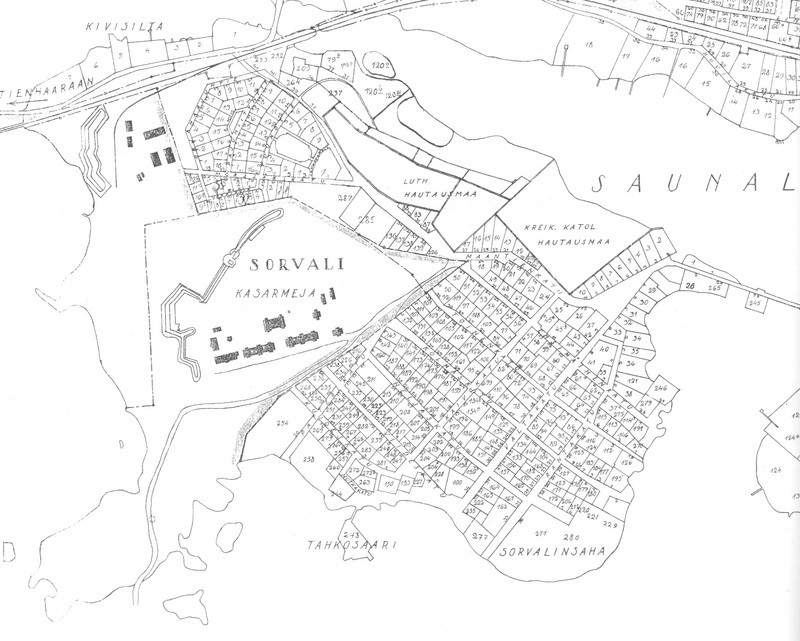 In 1898 Sorvali had 194 houses and about 2000 inhabitants. The western part of the island with a fortress built in 1856-66 was reserved for military use. The barracks and the area were finished immediately before World War 1. The last barrack was finished in 1938. Sorvali was incorporated into the town in 1933. A symbol of Sorvali was the stone bridge between Saunalahti and Sorvali. All western road transport went through the bridge until 1868. Railway communication was opened in 1870 when Sorvali also had its own halt. A sweet and macaroni factory of Pohjola-Koitto Oy was located in Sorvali from 1921. In addition, Viipurin Kalasavustamo Oy, Kivisillan Leipomo, Sorvalin Automaalaamo, timber yard of Puuteollisuus Oy, Sederholm & Kumppanien hautakiviliike, Sorvalin Kotileipomo, Leipomo B. Laane, Leipomo S. Jumppanen, and an old people’s home were located in Sorvali. Sorvali elementary school was built in 1931.